The Kingdom of Croatia-Slavonia (Croatian: Kraljevina Hrvatska i Slavonija; Hungarian: Horvát-Szlavón Királyság; German: Königreich Kroatien und Slawonien) was a nominally autonomous kingdom and constitutionally defined separate political nation within the Austro-Hungarian Empire, created in 1868 by merging the kingdoms of Croatia and Slavonia following the Croatian–Hungarian Settlement of 1868. It was associated with the Hungarian Kingdom within the dual Austro-Hungarian state, being within the Lands of the Crown of St. Stephen, also known as Transleithania. While Croatia has been granted a wide internal autonomy with "national features", in reality, Croatian control over key issues such as tax and military issues was minimal and hampered by Hungary. It was internally officially referred to as the Triune Kingdom of Croatia, Slavonia and Dalmatia, also simply know as the Triune Kingdom and had irredentist claims on Dalmatia, which was part of the Austrian Cisleithania. The city of Rijeka, following a fraud in the 1868 Settlement, known as the Rijeka Addendum became a Corpus separatum and was legally owned by Hungary, but administrated by both Croatia and Hungary. The Kingdom of Croatia-Slavonia was ruled by the Habsburg Emperor of Austria under his title as King of Croatia, Slavonia and Dalmatia and was confirmed by the State Sabor upon enthronement. The King's appointed steward was the Ban of Croatia and Slavonia. On 21 October 1918, Emperor Karl I, known as King Karlo IV in Croatia, issued a Trialist manifest, which was ratified by the Hungarian side on the next day and which unified all Croatian Crown Lands. One week later, on 29 October 1918, the Croatian Croatian State Sabor proclaimed an Independent Kingdom which entered the State of Slovenes, Croats and Serbs. The kingdom used the formal title of the Triune Kingdom of Croatia, Slavonia, and Dalmatia, thereby pressing its claim on the Kingdom of Dalmatia, but Dalmatia was a Kronland within the imperial Austrian part of Austria-Hungary (also known as Cisleithania). The claim was, for most of the time, supported by the Hungarian government, which backed the Croatia-Slavonia in an effort to increase its share of the dual state. The union between the two primarily Croatian lands of Austria-Hungary never took place, however. According to the Article 53 of the Croatian–Hungarian Agreement, governing Croatia's political status in the Hungarian-ruled part of Austria-Hungary, the ban's official title was "Ban of Kingdom of Dalmatia, Croatia and Slavonia". Not only would different parts of the Monarchy at the same time use different styles of the titles, but even the same institutions would at the same time use different naming standards for the same institution. For instance, when the Imperial and Royal Court in Vienna would list the Croatian Ban as one of the Great Officers of State in the Kingdom of Hungary (Barones Regni), the style used would be Regnorum Croatiae, Dalmatiae et Slavoniae Banus, but when the Court would list the highest officials of the Kingdom of Croatia and Slavonia, the title would be styled as "Ban of Croatia, Slavonia and Dalmatia" (putting Slavonia before Dalmatia and omitting "Kingdom"). The laws passed in Croatia-Slavonia used the phrase "Kingdom of Dalmatia, Croatia and Slavonia". In Hungarian, Croatia is referred to as Horvátország and Slavonia as Szlavónia. The combined polity was known by the official name of Horvát-Szlavón Királyság. The short form of the name was Horvát-Szlavónország and, less frequently Horvát-Tótország. The order of mentioning Dalmatia was a contentious issue, as it was ordered differently in the Croatian and Hungarian language versions of the 1868 Settlement. The Kingdom of Croatia-Slavonia was created in 1868, when the former kingdoms of Croatia and Slavonia were joined into one single kingdom (the full civil administration was introduced in the Kingdom of Slavonia in 1745 and it was, as one of the Lands of the Crown of St. Stephen, administratively included into both Kingdom of Croatia and Kingdom of Hungary, but it existed virtually until 1868). The Croatian parliament, elected in a questionable manner, confirmed the subordination of Croatia-Slavonia to Hungary in 1868 with signing of Hungarian-Croatian union constitution called the Nagodba (Croatian–Hungarian Settlement, known also as Croatian–Hungarian Agreement or Hungarian-Croatian Compromise of 1868). This kingdom included parts of present-day Croatia and Serbia (eastern part of Syrmia). After the Austro-Hungarian Compromise of 1867 the only remaining open question of the new state was the status of Croatia, which would be solved with the Hungarian-Croatian Compromise of 1868 when agreement was reached between the Parliament of Hungary on one hand and the Parliament of Croatia-Slavonia on the other hand, with regard to the composition by a joint enactment of the constitutional questions at issue between them. Settlement reached between Hungary and Croatia was in Croatian version of the Settlement named "The Settlement between Kingdom of Hungary, united with Erdély on the one side and the Kingdoms of Dalmatia, Croatia and Slavonia". In the Hungarian version neither Hungary, nor Croatia, Dalmatia and Slavonia are styled kingdoms, and Erdély is not even mentioned, while Settlement is named as the Settlement between Parliament of Hungary and Parliament of Croatia, Slavonia and Dalmatia. Both versions received Royal sanction and both as such became fundamental laws of the state with constitutional importance, pursuant to article 69. and 70. of the Settlement. With this compromise the parliament of personal union (in which Croatia-Slavonia had only twenty-nine, after 1881 – forty deputies) controlled the military, the financial system, Sea (Maritime) Law, Commercial Law, the law of Bills of Exchange and Mining Law, and generally matters of commerce, customs, telegraphs, Post Office, railways, harbours, shipping, and those roads and rivers which jointly concern Hungary and Croatia-Slavonia. Similarly to these affairs, trade matters including hawking, likewise with regard to societies which do not exist for public gain, and also with regard to passports, frontier police, citizenship and naturalization, the legislation was joint, but the executive in respect of these affairs was reserved to Kingdom of Croatia-Slavonia. In the end, fifty-five per cent of the total income of Croatia-Slavonia were assigned to the Joint Treasury ("Joint Hungarian-Croatian Ministry of Finance"). The kingdom existed until 1918 when it joined the newly formed State of Slovenes, Croats and Serbs, which together with the Kingdom of Serbia formed the Kingdom of Serbs, Croats and Slovenes. The new Serb-Croat-Slovene Kingdom was divided into counties between 1918 and 1922 and into oblasts between 1922 and 1929. With the formation of the Kingdom of Yugoslavia in 1929, most of the territory of the former Kingdom of Croatia-Slavonia became a part of the Sava Banate and in 1939 autonomous Croatian Banate (Banovina of Croatia). The Austro-Hungarian Compromise (Ausgleich) of 1867 created the Dual Monarchy. Under the Compromise, Austria and Hungary each had separate parliaments (the Imperial Council and the Diet of Hungary) that passed and maintained separate laws. Each region had its own government, headed by its own prime minister. The "common monarchy" consisted of the emperor-king and the common ministers of foreign affairs, defense and finance in Vienna. The Compromise confirmed Croatia-Slavonia's historic, eight-centuries-old relationship with Hungary and perpetuated the division of the Croat lands, for both Dalmatia and Istria remained under Austrian administration (as Kingdom of Dalmatia and Margraviate of Istria). At Franz Joseph's insistence, Hungary and Croatia reached the Compromise (or Nagodba in Croatian) in 1868, giving the Croats a special status in Hungary. The agreement granted the Croats autonomy over their internal affairs. The Croatian Ban would now be nominated by the joint Croatian-Hungarian government led by the Hungarian Prime Minister, and appointed by the king. Areas of "common" concern to Hungarians and Croats included finance, currency matters, commercial policy, the post office, and the railroad. Croatian became the official language of Croatia's government, and Croatian representatives discussing "common" affairs before the Croatian-Hungarian diet were permitted to speak Croatian. A ministry of Croatian Affairs was created within the Hungarian government. Although the Nagodba provided a measure of political autonomy to Croatia-Slavonia, it was subordinated politically and economically to Hungary in the Croatian-Hungarian entity of the Monarchy. The Croatian Parliament or the Royal Croatian-Slavonian-Dalmatian Sabor (Croatian: Kraljevski Hrvatsko-slavonsko-dalmatinski sabor or Sabor Kraljevina Hrvatske, Slavonije i Dalmacije) had legislative authority over the autonomous issues according to the Croatian-Hungarian Settlement of 1868. A draft law (bill), approved by the Diet, became a statute (an act) after the royal assent (sanction). It also had to be signed by the Ban. The King had the power to veto all legislation passed by the Diet and also to dissolve it and call new elections. If the King had dissolved the Diet, he must have called new elections during the period of three months. The parliament was summoned annually at Zagreb by the King or by the King especially appointed commissioner (usually the Ban). It was unicameral, but alongside 88 elected deputies (in 1888), 44 ex officio members were Croatian and Slavonian high nobility (male princes, counts and barons – similar to hereditary peers – over the age of 24 who paid at least 1000 forints (guldens) a year land tax), high dignitaries of the Roman Catholic, Greek Catholic and Eastern Orthodox churches and supreme county prefects (veliki župani) of all Croatian-Slavonian counties. Legislative term was three years, after 1887 – five years. The Croatian Parliament elected twenty-nine (after reincorporation of Croatian Military Frontier and Slavonian Military Frontier in 1881 – forty) deputies to the House of Representatives and two members (after 1881 – three) to the House of Magnates of the Diet of Hungary. The delegates of Croatia-Slavonia were allowed to use Croatian language in the proceedings, but they voted personally. The Kingdom of Croatia-Slavonia held independent elections for the Croatian Parliament in 1865, 1867, 1871, 1872, 1878, 1881, 1883, 1884, 1887, 1892, 1897, 1901, 1906, 1908, 1910, 1911, 1913. Main political parties represented in the Parliament were People's Party (People's Liberal Party), Independent People's Party (after 1880), Croatian-Hungarian Party (People's (National) Constitutional Party or Unionist Party) (1868–1873), Party of Rights, Pure Party of Rights (after 1895), Starčević's Party of Rights (after 1908), Serb Independent Party (after 1881), Croatian Peoples' Peasant Party (after 1904), Croat-Serb Coalition (after 1905) etc. Department of Justice (Croatian: Odjel za pravosuđe). At the head of the Autonomous Government in Croatia-Slavonia stood the Ban, who was responsible to the Croatian-Slavonian-Dalmatian Diet. The Ban was appointed by the King, on the proposal and under the counter-signature of the Joint Hungarian minister-president. The supreme court of the Kingdom of Croatia and Slavonia was the Table of Seven in Zagreb ("Table of Septemvirs" or "Court of Seven"; Croatian: Stol sedmorice), while the second-level court (court of appeal) was the Ban's Table or Ban's Court (Croatian: Banski stol) in Zagreb. After the judicial reorganization of 1874 – 1886 (complete separation of judicial and administrative power, laws on judges' independence and judicial organization, the Organization of Courts of the First Instance Act of 1874 (with 1886 amendments), the Judicial Power Act of 1874 and the Judges' Disciplinary Responsibility (etc.) Act of 1874, the Croatian Criminal Procedure Act of 1875, the Croatian Criminal Procedure Press Offences Act of 1875) and reincorporation of Croatian Military Frontier and Slavonian Military Frontier in 1881; courts of first instance were 9 royal court tables with collegiate judgeships (Croatian: kraljevski sudbeni stolovi in Zagreb, Varaždin, Bjelovar, Petrinja, Gospić, Ogulin, Požega, Osijek and Mitrovica; criminal and major civil jurisdiction; former county courts and Land Court/Royal County Court Table in Zagreb), approximately 63 royal district courts with single judges (Croatian: kraljevski kotarski sudovi; mainly civil and misdemeanor jurisdiction, former district administrative and judicial offices and city courts) and local courts (Croatian: mjesni sudovi), also with single judges, which were established in each municipality and city according to the Local Courts and Local Courts Procedure Act of 1875 as special tribunals for minor civil cases. The Royal Court Table in Zagreb was also a jury court for press offences. Judges were appointed by the king, but their independence was legally guaranteed. 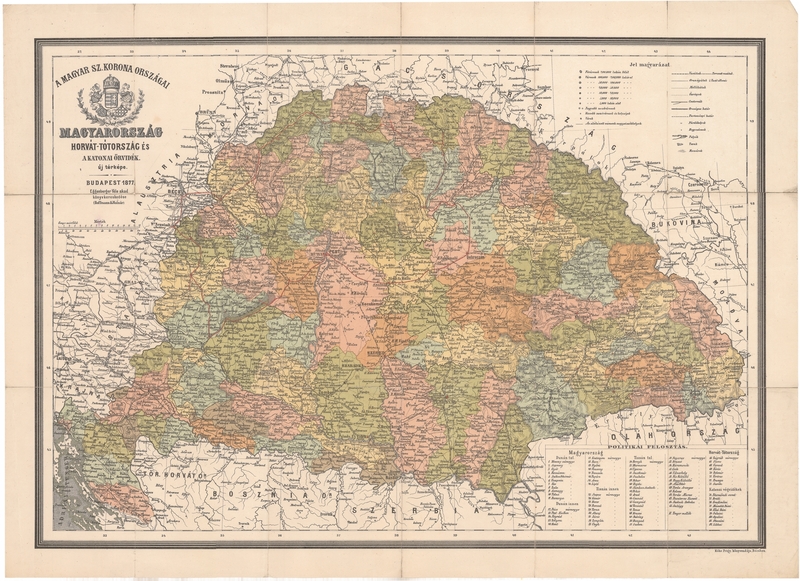 Lika-Krbava became a county after the incorporation of the Croatian Military Frontier into Croatia-Slavonia in 1881. The counties were subsequently divided into a total of 77 districts (Croatian: kotari, similar to Austrian Bezirke) as governmental units. Cities (gradovi) and municipalities (općine) were local authorities. Left: The flag with the Coat of Arms used internally "for autonomic affairs" by decree of the viceroy. It was officially prescribed to be crowned with the Crown of St. Stephen, but often used an alternate design, as depicted here. Middle:The official, but less common, flag with the Coat of Arms, topped with the crown of St. Stephen.Right: The flag without the Coat of Arms was the civil flag that was also used outside of the Kingdom. The red-white-blue tricolor is the civil flag in the Kingdoms of Croatia and Slavonia, which with the united coat of arms of Croatia, Slavonia and Dalmatia with the crown of St. Stephen on top is the official flag for usage in autonomous affairs. The aforementioned civil flag may be used by everyone in an appropriate way. It was also stated that the emblem for Joint Affairs of the territories of the Hungarian Crown is formed by the united Coat of Arms of Hungary and Dalmatia, Croatia and Slavonia. However, there were many variations of the internally used version of the flag, with some variants even using another type of crown or simply without any crown instead of the official Hungarian Crown of St. Stephen. There were also many variations in the type of shield. The unofficial Coat of Arms was the preferred design and its widespread use was reason that the Ban issued a Decree in 21 November 1914, stating that since it had become a custom in the Kingdoms of Croatia and Slavonia to use flags that are not adequate either in state-juridical or in political sense and which strengthened flag related laws, reiterated the aforementioned definitions of Croatian flags and stated that Police authorities shall punish violations of this Decree with a fine of 2 to 200 K or with arrest from 6 hours to 14 days and confiscate the unauthorized flag or emblem. Data taken from the 1910 census. According to the 1910 census, illiteracy rate in Kingdom of Croatia-Slavonia was 45.9%. The lowest illiteracy was in Zagreb, Osijek and Zemun. The Croatian Home Guard was the military of the Kingdom. Notable Croatians in the Austro-Hungarian Army included Field Marshal Svetozar Boroević, commander of the Imperial and Royal Aviation Troops Emil Uzelac, commander of the Austro-Hungarian Navy Maximilian Njegovan and Josip Broz Tito who later became Marshal and president of Yugoslavia. The modern University of Zagreb was founded in 1874. The Yugoslav Academy of Sciences and Arts and Matica hrvatska were the main cultural institutions in the kingdom. In 1911 the main cultural institution in the Kingdom of Dalmatia, Matica dalmatinska, merged with Matica hrvatska. Vijenac was one of the most important cultural magazines in the kingdom. The building of the Croatian National Theatre in Zagreb was opened in 1895. The Croatian National Theatre in Osijek was established in 1907. The Sisters of Charity Hospital in Zagreb was the first established in the kingdom. In 1890, there were 17,261 Jews living in the kingdom. In 1867 the Zagreb Synagogue was built. The first railway line opened in the kingdom was the Zidani Most-Zagreb-Sisak route which began operations in 1862. The Zaprešić-Varaždin-Čakovec line was opened in 1886 and the Vinkovci-Osijek line was opened in 1910. The Croatian Sports Association was formed in 1909 with Franjo Bučar as its president. While Austria-Hungary had competed in the modern Olympics since the inaugural games in 1896, the Austrian Olympic Committee and Hungarian Olympic Committee held the exclusive right to send their athletes to the games. The association organized a national football league in 1912. In 1918, during the last days of World War I, the Croatian parliament abolished the Hungarian-Croatian personal union, and both parts of the Kingdom of Croatia and Slavonia and the Kingdom of Dalmatia (excluding Zadar and Lastovo), became part of the State of Slovenes, Croats and Serbs, which together with the Kingdom of Serbia, formed the Kingdom of Serbs, Croats and Slovenes (later known as the Kingdom of Yugoslavia). The new Serb-Croat-Slovene Kingdom was divided into counties between 1918 and 1922 and into oblasts between 1922 and 1929. With the formation of the Kingdom of Yugoslavia in 1929, most of the territory of the former Kingdom of Croatia-Slavonia became a part of the Sava Banovina, and most of the former Kingdom of Dalmatia became part of the Littoral Banovina. On the basis of the political agreement between Dragiša Cvetković and Vlatko Maček (Cvetković-Maček Agreement) and the "Decree on the Banovina of Croatia" (Uredba o Banovini Hrvatskoj) dated 24 August 1939, the autonomous Banovina of Croatia (Banate of Croatia) was created by uniting the Sava Banovina, the Littoral Banovina, and districts Brčko, Derventa, Dubrovnik, Fojnica, Gradačac, Ilok, Šid and Travnik. ^ The Coat of Arms seen here is using the officially prescribed Crown of St. Stephen, but most often used another unofficial crown design instead. ^ The flag with the Coat of Arms was used internally for usage in autonomic affairs and was officially prescribed to depict the Hungarian Crown of St. Stephen above the shield, but the unofficial design depicted here using another type of crown was most often used instead. The same flag without the Coat of Arms was used as a Civil Flag. ^ See §. 2. 57. 58. 59. 60. Zakonski čl. XII. 1868. (Croatian-Hungarian Settlement) (in Croatian) "§. 57. Za organe zajedničke vlade ustanovljuje se takodjer hrvatski jezik službenim jezikom unutar granicah kraljevinah Dalmacije, Hrvatske i Slavonije. §.58. Predloge i spise u hrvatskom jeziku sastavljene; pa iz kraljevinah Hrvatske i Slavonije na zajedničko ministarstvo podnešene, imade to ministarstvo primati i rješitbe svoje na istom jeziku izdavati. §. 59. Obzirom na to, da su kraljevine Hrvatska i Slavonija politički narod, imajući posebni svoj teritorij i u pogledu nutarnjih svojih poslovah vlastito zakonodavstvo i autonomnu vladu, ustanovljuje se nadalje; da se zastupnici istih kraljevinah tako na zajedničkom saboru kako i u delegaciji mogu služiti i jezikom hrvatskim. §. 60. Na zajedničkom saboru stvoreni i podpisom Nj. c. i kr. apošt. Veličanstva providjeni zakoni izdavat će se za kraljevine Dalmaciju, Hrvatsku i Slavoniju u izvorniku hrvatskom i odaslati saboru tih kraljevinah. (transl.) §. 57. For the organs of the joint government, Croatian language is also established as the official language within the boundaries of the Kingdoms of Dalmatia, Croatia and Slavonia. §.58. Proposals and writings composed in Croatian language ; and submitted from the Kingdoms of Croatia and Slavonia to the joint ministry , the ministry has to receive them and issue its decision in the same language. §.59. Considering that the Kingdoms of Croatia and Slavonia are a political nation, having their own separate territory and, in terms of its own affairs, its own legislation and autonomous government, is further established; that the representatives of the same Kingdoms can use both in the joint parliament and in the delegation the Croatian language. §.60. Laws created at the joint Parliament, and sanctioned by H.I. and R. Apostolic Majesty shall be issued for the Kingdoms of Dalmatia, Croatia and Slavonia in the Croatian original and shall be send to the Parliament of these Kingdoms." Sbornik zakona i naredabah valjanih za kraljevine Hrvatsku i Slavoniju za god. 1868. (Komad I.-VI., br. 1.-19.) p. 122.-123. ^ See §. 59.Zakonski čl. XII. 1868. (Croatian-Hungarian Settlement) (in Croatian) "§. 59. Obzirom na to, da su kraljevine Hrvatska i Slavonija politički narod, imajući posebni svoj teritorij i u pogledu nutarnjih svojih poslovah vlastito zakonodavstvo i autonomnu vladu, ustanovljuje se nadalje; da se zastupnici istih kraljevinah tako na zajedničkom saboru kako i u delegaciji mogu služiti i jezikom hrvatskim. (transl.) §.59. Considering that the Kingdoms of Croatia and Slavonia are a political nation, having their own separate territory and, in terms of its own affairs, its own legislation and autonomous government, is further established; that the representatives of the same Kingdoms can use both in the joint parliament and in the delegation the Croatian language." Sbornik zakona i naredabah valjanih za kraljevine Hrvatsku i Slavoniju za god. 1868. (Komad I.-VI., br. 1.-19.) p. 123. ^ See; translation of the law XLIV. 1868. (law on nationality)/1868-ik évi XLIV. TÖRVÉNYCZIKK a nemzetiségi egyenjogúság tárgyában.THE LAW OF NATIONALITIES (Act XLIV of the year 1868.) "since all citizens of Hungary, according to the principles of the constitution, form from a political point of view one nation — the indivisible unitary Hungarian nation — of which every citizen of the fatherland is a member, no matter to what nationality he belongs: since, moreover, this equality of right can only exist with reference to the official use of the various languages of the country,...§ 29. The provisions of this law do not extend to Croatia Slavonia and Dalmatia, which possess a special territory and form politically a special nation;" RACIAL PROBLEMS IN HUNGARY By SCOTUS VIATOR, Author, Robert William Seton-Watson. Publisher, Constable, 1908. ^ Hrvatska enciklopedija (LZMK). "Hrvatsko-ugarska nagodba". Retrieved 6 April 2019. ^ "Nagodba". britannica.com. Retrieved 6 April 2019. ^ Croatian-Hungarian settlement, Constitution, 1868, Article §. 1. ^ Goldstein & Jovanović 1999. ^ See; Charles IV. Coronation diploma inaugurale issued to the Parliament of Croatia-Slavonia pursuant to §. 2. of the Settlement Zak. čl. III. : 1917. zajedničkog ugarsko-hrvatskog državnog sabora, kojim se kraljevska zavjernica, što ju je Njegovo Veličanstvo kralj izdao zemlji prije Svoje sretne posvete i krunisanja, te kraljevska zakletva, što ju je položio prigodom krunisanja, uvršćuju medju zakone države [Legal. Art. III. : 1917. of the Joint Hungarian-Croatian State Parliament, by which the coronation testament which His Majesty the King has given to the land before His happy consecration and crowning, and the royal oath which he placed upon the occasion of the crowning, are enshrined in the laws of the state], (in Croatian) "§. 1. Sveto i nepovredimo obdržavat ćemo, a kraljevskom Našom moći i po drugih obdržavati dati nasljedbu na kraljevski prestol, ustanovljenu u zakonskom članku 1. i 2. članku god. 1723.; - krunisanje koje se ima obaviti u smislu zakonskog članka 3. godine 1791.; - prava, ustav, zakonitu neodvisnost, slobodu i zemljišnu cjelovitost Ugarske te Hrvatske, Slavonije i Dalmacije, a isto tako cjelokupnost i zemaljski ustav kraljevina Hrvatske, Slavonije i Dalmacije , koje s kraljevinom Ugarskom sačinjavaju jednu te istu državnu zajednicu. Sveto i strogo obdržavat ćemo, a kraljevskom Našom moći i po drugima obdržavati dati zakonito postojeće sloboštine, povlastice, zakonske običaje i dosad po saborima stvorene i po slavnim Našim predjima, krunisanim Ugarske Kraljevima posvećene, kakono i one, što će i odsada po saborima stvoriti i po Nama kao krunjenom Kralju ugarskom posvetiti zakone Ugarske te Hrvatske, Slavonije i Dalmacije u svih njihovih točkama, člancima i zaporkama tako, kako što će njihov smisao i uporaba zajedničkim suglasjem kralja i sabora ustanovljeni biti; izuzevši ipak dokinutu onu zaporku zakona blagopopokojnoga Andrije II. od god. 1222., počevši od riječi: "Quodsi vero nos" sve do onih riječi "in perpetuam facultatem". Za obezbjedjenje svega toga služit će i ona kraljevska zakletva Naša, što ćemo ju po sadržaja ove Naše kraljevske zavjernice na osnovu riječi krunidbene zakletve slavnoga Nam predšastnika Ferdinanda I. prigodom krunisanja Našega položiti. ... §. 3. Sve one strane i pripadnosti Ugarske te Hrvatske, Slavonije i Dalmacije što su već natrag stečene, pa i one, što će božjom pomoćju odsele biti natrag pribavljene, pripojit ćemo u smislu krunitbene Naše zakletve rečenim kraljevinama." Krunidbena zavjernica Karla IV. Zbornik zakona i naredaba valjanih za Kraljevine Hrvatsku i Slavoniju, kom. V. str. 101-105., Zagreb 1917. ^ Budisavljević Srđan, Stvaranje Države SHS, (Creation of the state of SHS), Zagreb, 1958, p. 132-133. ^ Hivatalos Statistikai Közlemények. Kiadja: A Földmivelés-, Ipar- És Kereskedelemügyi Magyar Királyi Ministerium Statistikai Osztálya. Évf. 2. Füz. 1. 1869. p. 160. ^ State union between Hungary and Croatia-Slavonia was formally known as personal union, in reality it was real union with self rule for Croatia-Slavonia. ^ After the establishment of the Royal Croatian-Slavonian-Dalmatian Land Government (Royal Land Government or informally Autonomous Government), the Croatian Court Chancellery or (officially) Royal Croatian-Slavonian-Dalmatian Court Chancellery in Vienna (1862–1869) as supreme governmental body for Croatia and Slavonia organized in accordance with the October Diploma and the February Patent and the Royal Croatian-Slavonian Council of Lieutenancy in Zagreb (1861–1869) were abolished. ^ Ivan Čepulo (April 2006). "Izgradnja modernog hrvatskog sudstva 1848 – 1918" [Building up of the Modern Croatian Judiciary 1848 – 1918]. Zbornik Pravnog fakulteta u Zagrebu: Collected Papers of Zagreb Law Faculty (in Croatian). Zagreb, Croatia: University of Zagreb, Law Faculty. 56 (2–3): 325–383. ISSN 0350-2058. Retrieved 20 January 2017. ^ Heimer, Željko. "Hrvatska-povijesne zastave". zeljko-heimer-fame.from.hr. Retrieved 2 March 2019. ^ Heimer, Željko; Zdvořák, Janko Ehrlich. "Croatia in the Habsburg Empire". crwflags.com. Retrieved 4 March 2019. ^ a b Heimer, Željko; Zdvořák, Janko Ehrlich. "Croatia in the Habsburg Empire". crwflags.com. Retrieved 2 March 2019. ^ a b Seton-Watson, Hugh (1945). Eastern Europe Between the Wars, 1918–1941 (3rd ed.). CUP Archive. p. 434. ISBN 1-00-128478-X. ^ Kroatien, Slavonien, Dalmatien Und Das Militargrenzland, p. 20. Biondich, Mark (2000). Stjepan Radić, the Croat Peasant Party, and the Politics of Mass Mobilization. University of Toronto Press. ISBN 0-8020-8294-7. "Croatia-Slavonia" . Encyclopædia Britannica. 7 (11th ed.). 1911. pp. 471–477.